Achieving the Sustainable Development Goals would significantly slow population growth, a landmark study from the IIASA World Population Program shows. Achieving the Sustainable Development Goals (SDGs) set by the UN in 2015 for the period up to 2030 would lead to a global population of between 8.2 to 8.7 billion by 2100, according to a new study conducted by IIASA and the Asian Demographic Research Institute at Shanghai University. 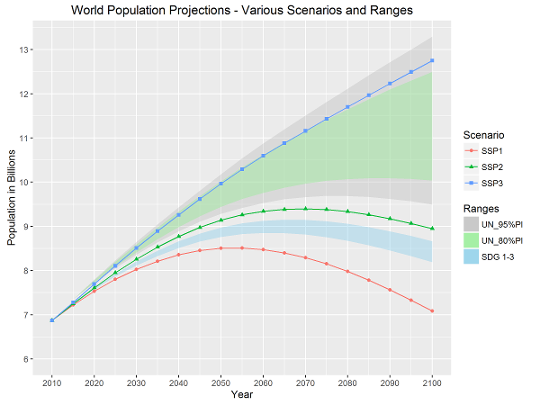 According to the study, published in the journal Proceedings of the National Academy of Sciences, achieving the SDGs would lead to population growth below even the lower bound of recent UN probabilistic population projections. Although population is not mentioned in any of the 169 SDG targets, many people think it is a decisive factor for global environmental change and future human wellbeing. The study is the first to assess how successful implementation of the SDGs would affect population growth. Assuming that for the period 2015-2030 the goals will serve as a turbo boost for development, it finds that achieving the SDGs would lead to global population peaking by 2060, and declining to between 8.2 and 8.7 billion by 2100. The effects of increasing female education on lowering birth rates in developing countries, and the health target that includes universal access to reproductive health services are the key factors. Achieving these two goals, the study showed, would lead to reduced fertility rates in much of the developing world. The researchers note that achieving the SDGs would also lead to reduced mortality, which would tend to increase population, but that in the longer term, decreased mortality rates also contributes to lower birth rates. Even if the goals were only partly achieved, the study finds potentially significant decrease in population growth. However, if the international community fails to reach the SDGs then world population growth will be higher, people will be poorer and in worse health, and more vulnerable to environmental change. Abel G, Barakat B, KC S, Lutz W (2016). Meeting the Sustainable Development Goals leads to Lower World Population Growth. Proceedings of the National Academy of Sciences 113 (50): 14294–14299.